Happy 4th of July to everybody!!! We are here at the Sarasota Farmers Market and there's a lot of people enjoying this beautiful day... Come join us. Please follow the link and read al the important information about Partially Hydrogenated oil, you will learn what is going on with the food and big corporations. This june we have several orders of Goat Cheese Ravioli, it is very flavorful, a must try in our raviolis fillings. 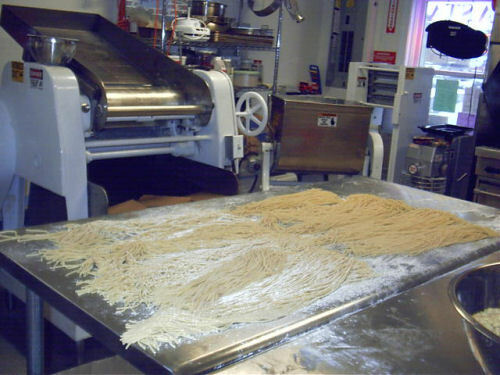 Whole Wheat fresh pasta is the best choice for you health and Whole Wheat fresh pasta taste very good. We where helping our customers, fortunately very busy Mother's day weekend, when we see a man drawing something on the street in front of our booth. When we took a closer look it said "TRY NONNA'S SAUCE" with an arrow pointing at us, this man then looked at us and said "I LOVE IT". Nonna's Sauce is made in honor to Marina's Grandmother, who created it and prepared it for Marina's family when she was a very young girl. The memory stayed with her and now is one of our Specialties. We didn't get a chance to thank this customer for the beautiful drawing/sign. So if you are reading this and want to come and do it again, there will be a Nonna's sauce and some wonderful fresh pasta for you to take home as a token of our appreciation. 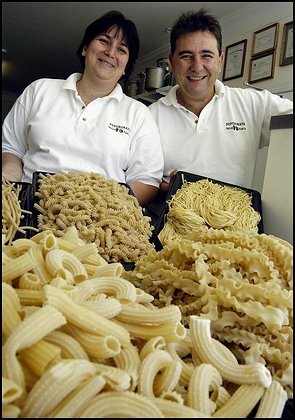 Don't miss the Local farmers Market, the best fresh products you can find will be there and the Best Fresh Pasta!! Downtown Farmers Market (Lemon & Main) hours have changed, we are open from 7 am to 12 pm, this are our summer hours. Siesta Key Farmers Market is still operating from 7 am to 1 pm. See you there!! How to cook FRESH PASTA?